Eating is one of the most important aspects of losing weight. The foods you choose play a key role in how successful your weight-loss efforts are, as well as how quickly you are able lose your desired number of pounds. Chili can be an effective weight-loss food if you select the most nutritious ingredients and eat it in place of higher-calorie and higher-fat fare. Howard M. Shapiro and Franklin Becker, authors of "Eat & Beat Diabetes With Picture Perfect Weight Loss," note that eating chili can help lower your cholesterol and increase your intake of many important nutrients. Eat chili without meat. Chili recipes that contain ground beef or ground pork are often quite high in saturated fat, which can damage your health and impede your weight-loss goals. If you must have meat in your chili, prepare it with the leanest ground beef or pork available, which will decrease the saturated fat content a bit. Choose chili that is loaded with beans and tomatoes. Beans and tomatoes are both low in calories, which helps you reduce your total caloric intake so you can begin to shed pounds. Beans are also high in fiber and protein, two nutrients that contribute to a feeling of fullness, as well as an elevated energy level. Select healthy add-ins and toppings. Sour cream, cheese and corn chips are common accompaniments to a bowl of chili, but are all high in fat and calories. Low-fat cheddar cheese is a healthier alternative that will reduce your intake of fat, but will keep the calcium content of your meal the same. Chopped onions, roasted green chilies and whole -wheat crackers are additional ingredients that will help you achieve your weight-loss goals by reducing the fat and calorie content of your chili. 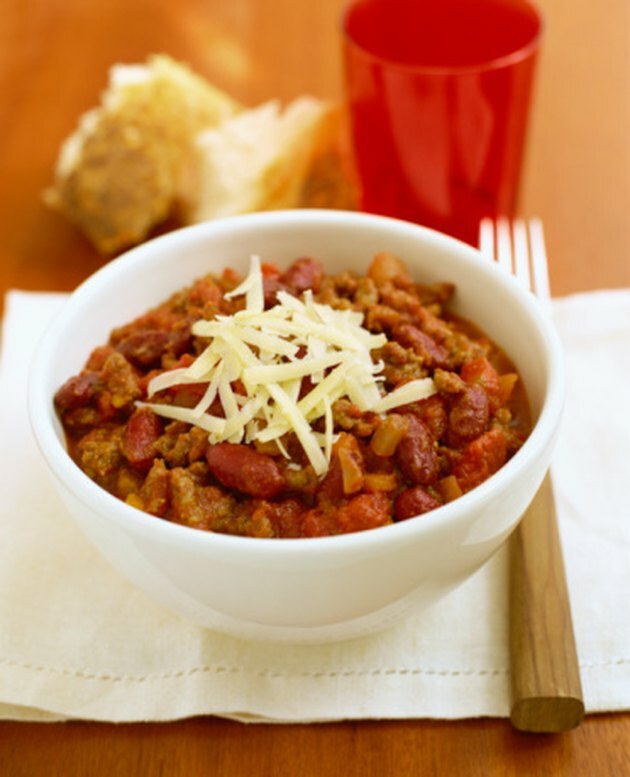 Browse the shelves at your local library for books that contain healthy chili recipes. Try several different recipes to determine what combination of ingredients you enjoy. Make your weight-loss plan with the supervision of your doctor so you can be sure that your goals are healthy and safe for you.